Sitting down for refreshments, or just to admire the scenery, often (curiously) produces interesting sightings. Such was the case on 2nd April 2017, when we took a tea break in the grounds of Glencanisp Lodge (NC1122), after a most enjoyable walk up the Abhainn Bad na h-Achlaise. There, at our feet, in some shredded conifer bark, were three striking fungi, about the size of golf or tennis balls, with short stalks and convoluted, velvety brown tops. 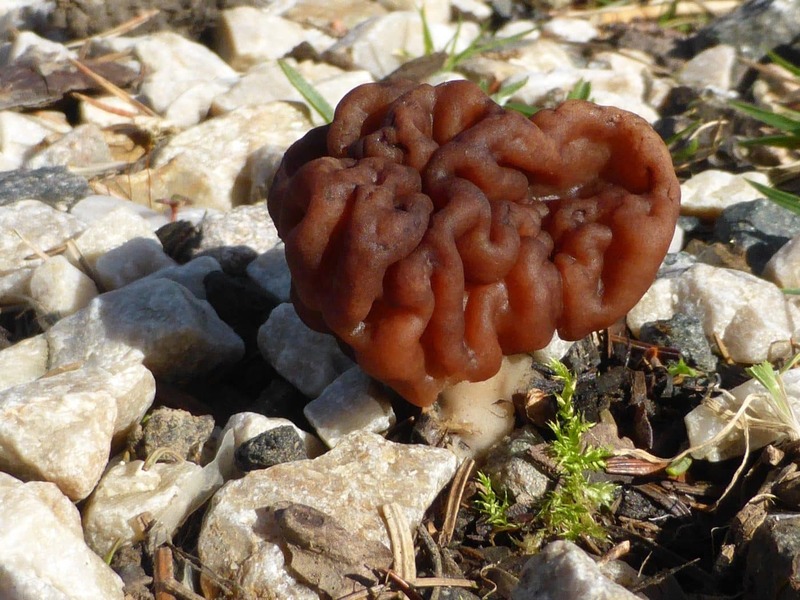 At first, we thought they might be morels, but the brain-like folds did not fit that group. They were, in fact, fruiting bodies of the false morel Gyromitra esculenta, an uncommon species associated with conifers. With the widespread use of conifer bark as mulch in gardens it may be expanding its range. Its specific name is unusually misleading, since esculenta translates as edible, and this species is deadly poisonous when raw. It is apparently eaten in Eastern Europe after being boiled twice, with the water from the first boiling discarded, but even then may still be poisonous if eaten more than once! Go on-line for the cautionary details. False morels were first reported locally in September 2012 from the grounds of a house at Inverkirkaig (NC0719), where Chris Pellant told us it occurred regularly. 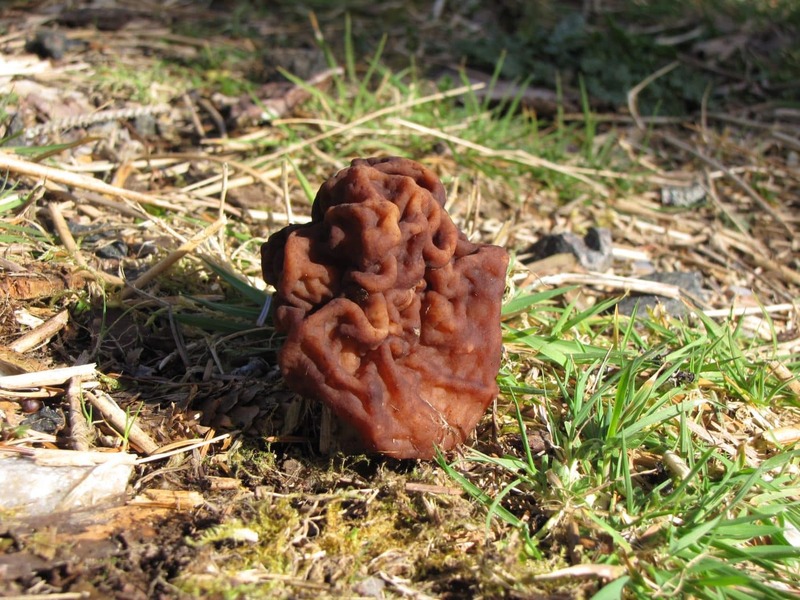 A close but even rarer relative, the pouched false morel Gyromitra infula, was found by Nancy Millar on bark mulch in her garden at the Schoolhouse, Drumbeg (NC1232) in April 2008 and identified by the late John Blunt.